Pioneer in the Hemp Food Industry for 24 Years. Consult the Consultant your Consultant consults. Colorado’s recent Amendment X was one of the oddest and most-divisive hemp laws in years. Pushed not by hemp farmers, or hemp breeders, or hemp processors, or hemp activists, it was instead pushed by Legislators in the Colorado statehouse who apparently didn’t like the will of the voters who approved hemp back in 2012, putting max THC of 0.3% in the state Constitution beyond the reach of politicians. Bizarrely, they actually went out of their way to give the power to the Feds to kill Colorado hemp if it so desired, with nothing to gain. It was a solution in search of a problem, and could come back to bite Colorado hemp. That many of those pushing it were profoundly rude to the conscientious activists who questioned the wisdom of giving the Feds power over the nation’s first 10th Amendment hemp state, growing even before the 2014 Farm Bill allowed it, was in profoundly poor taste and raised questions as to who was the mysterious entity actually behind it. Their stated reason was that IF the Feds allowed 1% max THC, Coloradans would be at a disadvantage. But like I said, this was from politicians disintermediated by Amendment 20in 2012, not farmers. IF the Feds moved to 1%, then it would make sense to change the state Constitution to conform. But we can’t even get the Farm Bill, S 2667, H 5485, or H 3530 passed, and the worst that would happen anyway is farmers would have to wait until the next election cycle to get it changed, two years max. 1) Establish 1% as the maximum THC level, or the maximum recognized by the Feds, whichever is greater. The world of hemp will soon move to 1% as the max THC (the stated reason for Amendment X), and many already have (West Virginia, Switzerland, Australia, most tropical countries). Alternatively, recognize the UN definition of hemp: “CBD-to-THC ratio greater than 1”. 2) Allow products to be sold containing THC up to 10,000 ppm (1%). 3) Expunge all marijuana felonies in the state automatically, and upon request by any living person for the benefit of any deceased person. This eliminates the industry-dividing tactic of banning nonviolent marijuana felons from hemp, popular in some states and threatened to be put in the Farm Bill by prohibitionist Senator Grassley. The posthumous request allows someone to “clear the record” for a dead relative or friend, removing the stigma of conviction for growing or possessing a nontoxic, safe plant in the era of prohibition. 4) Strike “Tetrahydrocannabinols” from CRS 18-18-203 2(c) XXIII, to finally deschedule Cannabis in Colorado. 6) Re-introduce “lowest priority enforcement” of marijuana and hemp laws by the police and prosecutors. It worked before “legalization,” it’ll work again. 7) Declare all hemp flower products (flowers, seed, stalk, trichomes, terpenes, and cannabinoids including CBD and THC) to be ingredients existing before October 1994, for the purposes of DSHEA. This grandfathers hemp flower products, making them legal food ingredients to FDA and all state FDAs. It’s only fair, considering the 12,000+ years of continuous safe use of hemp flower products around the world. 8) Test cultivated hemp for THC within 50 days of planting, and specify that it is not over 0.3% until it is 0.4%. 9) Allow remediation not destruction of hemp products or flowers exceeding maximum THC. 10) Require DORA use marijuana taxes to pay CDA hemp program fees. 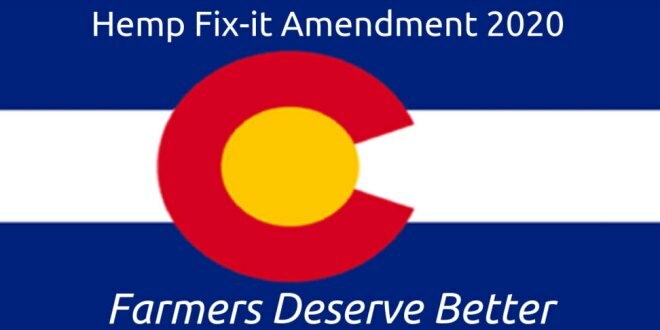 The Colorado Hemp Fix-it Initiative of 2020 recognizes the Overton Window and the need to start far beyond where we want to end up. Such as when negotiating to sell something for $100 you don’t start there, you offer it at $150. That also shifts the expectation of the outcome to your favor. If the Powers That Be really do care about the future of hemp sustainability in Colorado, this will be on the ballot in 2020.